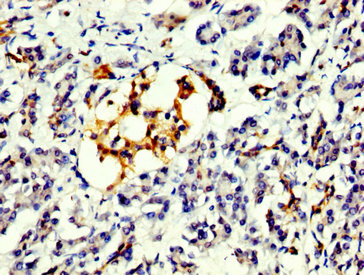 IHC image of PRDM10 Polyclonal Antibody diluted at 1:300 and staining in paraffin-embedded human pancreatic tissue performed on a Leica BondTM system. After dewaxing and hydration, antigen retrieval was mediated by high pressure in a citrate buffer (pH 6.0). Section was blocked with 10% normal goat serum 30min at RT. Then primary antibody (1% BSA) was incubated at 4°C overnight. The primary is detected by a biotinylated secondary antibody and visualized using an HRP conjugated SP system. 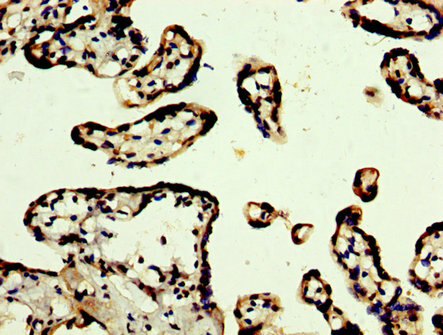 IHC image of PRDM10 Polyclonal Antibody diluted at 1:300 and staining in paraffin-embedded human placenta tissue performed on a Leica BondTM system. After dewaxing and hydration, antigen retrieval was mediated by high pressure in a citrate buffer (pH 6.0). Section was blocked with 10% normal goat serum 30min at RT. Then primary antibody (1% BSA) was incubated at 4°C overnight. The primary is detected by a biotinylated secondary antibody and visualized using an HRP conjugated SP system. The protein encoded by this gene is a transcription factor that contains C2H2-type zinc-fingers. It also contains a positive regulatory domain that has been found in several other zinc-finger transcription factors including those involved in B cell differentiation and tumor suppression. Studies of the mouse counterpart suggest that this protein may be involved in the development of the central nerve system (CNS), as well as in the pathogenesis of neuronal storage disease. Multiple alternatively spliced transcript variants encoding distinct isoforms have been observed. PRDM10 Polyclonal Antibody. Unconjugated. Raised in: Rabbit.